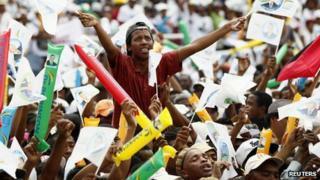 Voters in Madagascar go to the polls on 20 December for the presidential run-off. It is hoped that the election of a new president will end more than five years of economic paralysis spawned by international sanctions, imposed after Marc Ravalomanana's democratically-elected government was overthrown in a military-backed takeover in 2009. The first round, which was held on 25 October, produced no outright winner. International observers said that the polling was largely peaceful, despite some incidents of violence, and that they were free and fair. The run-off will be held on the same day as parliamentary elections. The parliamentary polls are considered important as the first task of the new MPs will be to nominate a prime minister. The two candidates are backed by the two titans of Madagascar politics - incumbent President Andry Rajoelina and the man he ousted, Marc Ravalomanana. Mr Robinson is standing for the Avana [Rainbow] party. He served as health minister in Mr Ravalomanana's government and gained his support after the ousted president's wife, Lalao, was disqualified from standing in the first round. Mr Ravalomanana, who lives in exile in South Africa, still commands a lot of support in Madagascar. Mr Robinson garnered 21.16% of the votes in the first round. He has since gained the backing of two more former presidential hopefuls - Saraha Georget Rabeharisoa of the Green Party of Madagascar, and former prime minister Camille Vital. He has said his manifesto will draw heavily on the policies of Mr Ravalomanana's Madagascar Action Plan (MAP) to help rebuild the country and rejuvenate the ailing tourism industry. Born in 1952, Richard Jean-Louis Robinson is a medical doctor by training and once worked as a consultant for the UN in Madagascar. Mr Rajaonarimampianina is backed by President Rajoelina. A former finance minister in Mr Rajoelina's government, Mr Rajaonarimampianina came second in the first round with 15.85% of the vote. He says he will help the unemployed, build infrastructure to improve agriculture, reform the education system and make Madagascar a strong democracy. Mr Rajaonarimampianina has the backing of Malagasy Tonga Saina (the Conscious Malagasies party) candidate Roland Ratsiraka - a nephew of former President Didier Ratsiraka - as well as the former minister of foreign affairs and presidential candidate, Pierrot Rajaonarivelo. Mr Rajaonarimampianina, 55, holds a degree in economics and accounting from the University of Quebec in Canada. President Rajoelina's decision to back one of the candidates has been controversial, with many accusing him of bias. On 10 December, transitional Prime Minister Omer Beriziky urged politicians to observe neutrality during the elections. Many people also complained of disenfranchisement during the first round of voting, saying that their names were missing from the voters' register. The Independent National Electoral Commission of the Transition (CENIT) has said it will allow some of them to vote "under certain conditions" but has rejected calls for a total revision of the electoral roll. How has the media covered the election? State broadcaster ORTM (Office de la Radio et de la Television Malgache) has broadcast three live debates - on the economy, foreign relations and political issues and institutional reforms. The Paris-based organization, Reporters Without Borders (RSF), has called on private and state media to give free and equal airtime to both candidates. Who is managing the run-off? The Independent National Electoral Commission of the Transition (CENIT) - an independent electoral body funded by the United Nations - will oversee the poll. CENIT says there are 7,697,382 registered voters and 20,115 polling stations in the country. Will there be foreign observers? A total of about 398 international observers are expected to monitor the 20 December presidential run-off and legislative elections. The Southern African Development Community (SADC) has deployed 256 observers led by Namibian Foreign Affairs Minister Netumbo Nandi-Ndaitwah. They will be dispatched to the 22 regions of Madagascar. The EU Election Observation Mission (UE-EOM) has deployed 42 long-term observers.